Caspar David Friedrich (5 September 1774 – 7 May 1840) was a 19th century German painter, considered by many critics to be one of the finest representatives in Europe of the art-movement Romanticism. The beauty, the spirit of Germany, its sun, moon, stars, rocks, seas and rivers can never be expressed this way.. I just stepped out of the dark, still forest and found myself on a rising hill. In front of me I saw a valley, surrounded by fertile hills, in which a town stood and the newly covered slate roof of the tower glowed in the evening light. Through the richly-flowered, carpeted meadow the river meandered.. .And behind the hills lay the mountains.. ..cliff after cliff rose far out into the horizon.. .Filled with soaring joy I stood there a long time and looked at the beautiful area..
Gently rising hills block the view into the distance; line the wishes and desires of the children, who enjoy the blissful moments of the present without wanting to know what lies beyond. Bushes in bloom, nourishing herbs, and sweet-smelling flowers surround the quiet clear stream in which the pure blue of the cloudless sky is reflected like the glorious image of God in the souls of the children.. .There is no stone to be seen here, no withered branch, no fallen leaves. The whole of nature breathes, peace, joy, innocence and life. God, I thank you that I live / Not forever in this world / Strengthen me that my soul rise / Upward toward your firmament. See the terrifying force of the tempest / Bows the oaks so that is groans, / And the rose on the beautiful pasture / has ben bent down by the rain. If a painting has a soulful effect on the viewer, if it puts his mind into a soulful mood, then it has fulfilled the first requirement of a work of art. However bad it might be in drawing, color, handling, etc. Jesus Christ, nailed to the Cross [in his painting 'Cross in the Mountains (Tetschen Altar)',] is turned to the setting sun, here the image of the totally enlivening Father. With Christ dies the wisdom of the old world, the time when God the Father wandered directly on Earth. This sun set and the world was no longer able to apprehend the departed light. The evening glow shining from the pure noble metal of the golden crucified Christ is reflected in gentle glow to the earth. The Cross stands raised on a rock, unshakably firm, as our faith in Jesus Christ. Around the Cross stand the evergreens, enduring through all seasons, as does the belief of Man in Him, the crucified. So often death, perishing and the grave? One must often submit oneself to death. The picture [Friedrich's painting: 'The Cross on the Baltic Sea' ] for your friend has already been sketched out, but there is no church in it, not a single tree or plant, not a blade of grass. On a bare and rocky seashore there stands, high up, the cross - for those who see it that way, a consolation, and for those who don't see it that way, just a cross. Sometimes I try to think and nothing comes out of it; but it happens that I doze off and suddenly feel as though someone is rousing me. I am startled, open my eyes, and what my mind was looking for stands before me like an apparition - at once I seize my pencil to draw; the main thing has been done. ..the great white blanket of snow [in one of his painting of Cemetery / Church in the Snow, mid-1820's].. ..the essence of the utmost purity, beneath which nature prepares herself for a new life..
Just as the reverent man prays without uttering words, and the Lord hears him, the sensitive painter paints, and the sensitive man understands and recognizes him, but even the more obtuse carry away something from his work. Man should not be held as an absolute standard for mankind, but the Godly, the infinite is his goal.. .Follow without hesitation the voice of your inner self; for it is the Godly in us and leads us not to astray..
You should keep sacred every impuls of your mind; you should keep sacred every pious sentiment; because that is art in us. In an inspired hour she will appear in a clear form, and this form will be your picture. The artist's feeling is his law. Genuine feeling can never be contrary to nature; it is always in harmony with her. But another person's feelings should never be imposed on us as law. Spiritual affinity leads to similarity in work, but such affinity is something entirely different from mimicry. Whatever people may say of Y's paintings and how they often resemble Z's, yet they proceed from Y and are his sole property. Every truthful work of art must express a definite feeling, must move the spirit of the spectator either to joy or to sadness.. ..rather than try to unite all sensations, as thought mixed together with a twirling stick. What pleases us about the older paintings is above all their pious simplicity.. .However, we do not want to become simple as many have done, but rather become pious and imitate their virtues. I am far from wanting to resist the demands of my time, except when they are purely a matter of fashion. Instead, I continue to hope that time itself will destroy its own offspring, perhaps quite soon. But I am not so weak as to submit to the demands of the age when they go against my convictions. I spin a cocoon around myself; let others do the same. I shall leave it up to time to show what will come of it: a brilliant butterfly or a maggot. People say of such-and-such a painter that he has great command of his brush. Might it not be more correct to say that he is controlled of his brush? Merely for the satisfaction of his vanity, to paint brilliantly and display skill with the brush, he has sacrificed the nobler considerations of naturalness and truth – and thus achieved sorry fame as a brilliant technician. In this big moonlit landscape by the painter N.N., that deservedly celebrated technician, one sees more than one would wish, or that can actually be seen by moonlight. But what the perceptive, sensitive soul looks for in every painting, and rightly expects to find, is missing.. ..If that painter could find it in himself to paint fewer, but more deeply-felt, pictures instead of so many clever ones, his contemporaries and posterity would be more grateful to him. To many it is incomprehensible that art has to emerge from a person's inner being, 'that it has to do with one's morality, one's religion..'. But so it does. You should trade only in what you recognize to be true and beautiful, noble and good in your soul. People are always talking about 'incidentals'; but nothing is incidental in a picture, everything is indispensable to the whole effect, so nothing must be neglected. If a man can give value to the main part of his composition only by negligent treatment of the subordinate portions, his work is in a bad way. Everything must and can be carefully executed, without the different parts obtruding themselves on the eye. The proper subordination of the parts to the whole is not achieved by neglecting incidental features, but by correct grouping and by the distribution of light and shadow. It is doubtful whether the artist [unknown] altogether knew what he depicted here in this panel, and even more doubtful whether he could have expressed it in words. That which we praise here as well thought-out and cleverly arranged may, in fact, have been achieved by him unconsciously; for the artist was transformed by pure harmoniousness while executing this picture, and his feeling become his law. Only his disposition, his spiritual exaltation, could have brought forth such a fruit as this picture. Just as the pious man prays without speaking a word and the Almighty hearkens unto him, so the artist with true feeling paints and the sensitive man understands and recognizes it; while even the less sensitive gain some inkling of it. When a landscape is enveloped in mist it appears larger, more majestic, and increases the power of imagination.. .The eye and the imagination are on the whole more attracted. 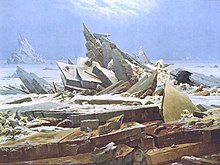 We urge the artist [Friedrich] to undertake serious study of antiquity and of nature as the ancients saw it. Here is coldness, impetuousness, dying, and despair. The works of Friedrich differ greatly from those of other landscape painters in their motifs. The air - even though he paints it masterfully - takes up more than half of the space in most of his compositions. Middle- and background are often missing because his motifs don't require them. He likes to paint unfathomable plains. He is faithful to nature even in the smallest details and he has mastered his technique - in his oil paintings and sepia drawings - to perfection. His landscapes contain a melancholy, mysteriously religious meaning. They affect the heart more than the eye. ..I must not neglect to report to you the three friends I have won. The firsts the composer Carl Maria [von] Weber.. ... the second, the landscape painter Friedrich.. ..His paintings are actually lyrical poems.. ..I described for him lately, when we conversed of suchlike moods, the rare beauty of the moonlight that we [Hjort and Olivia Rasbech] observed as we wandered past the old limestone kiln, and my words fell so fortuitously that he burst out: Das mach ich Ihnen! [I shall paint that for you!].. ..prepared to take my leave he said: Give me the lady's address the next time we meet, and you shall find that upon your return from this voyage, the painting shall adorn her wall.. .. At the very next meeting between us, he demanded to be shown your portrait, which I naturally had in my possession, and he already had a first draft of the painting, which he showed to me with these very words: Nicht wahr? So war's? [That’s how it was, wasn't it?].. .I hesitated for a few weeks, but then I had to yield, upon which he solemnly declared: Ein festes Auge, das ist jafast wie ein Knäblein! Mag's einen herrlichen Charakter geben, wenn sie ins Leben tritt [A firm gaze; it is almost like that of a small boy! May it give her a delightful character when she steps out into life]. Hojrt arrived (from Norway) in Dresden 27 Sept. 1817 and stayed there until 23 Nov. - a friendship grew between him and Friedrich. ..it was a picture of the kind that only an aeronaut can see, when he rises in his airship above the height of the clouds.. ..up to where.. ..the untroubled blue of the heaven is visible between the wisps of mist. It is magnificent to stand in infinite solitude on the seashore, beneath an overcast sky, and to look on an endless waste of water. Part of this feeling is the fact that one has made life's way there and yet must go back, that one would like to cross over but cannot, that one sees nothing to support life and yet senses the voice of life in the sigh of the waves, the murmur of the air, the passing clouds and the lonely cry of birds. Part of this feeling is a claim made by the heart and a rejection, if I may call it that, on the part of nature. But this is impossible in front of the picture, and what I should have found in the picture itself I found only between myself and the picture, namely a claim my heart made on the picture and the picture's rejection of me; and so I myself became the monk, and the picture became the dune, but the sea itself, on which I should have looked out with longing — the sea was absent. There can be nothing sadder or more desolate in the world than this place: the only spark of life in the broad domain of death, the lonely center in the lonely circle. The picture, with its two or three mysterious subjects (monk, dune, sea), lies there like an apocalypse..
Why, if the artist painted this landscape using its own chalk and its own water, I believe he would make the foxes and wolves weep: the most powerful praise, without doubt, that could be given to this kind of landscape painting. GOVERNESS: Why did he paint nothing but dull skies? How lovely it would be if he had painted some men gathering amber on the seashore. FIRST YOUNG LADY: Oh yes, I'd like to fish for a nice amber necklace for myself. SECOND GENTLEMAN: [the monk].. ..he does predict the weather, he is the one within the wholeness, the lonely center in the lonely circle. FIRST GENTLEMAN: Yes, he is the soul, the heart, the whole picture's reflection in itself and on itself. LADY: Oh, I felt so at home in front of the picture, it truly touched me. It is truly lifelike, and when you were talking like that, it was all hazy, just like when I went for a walk beside the sea with our philosophical friends. I only wish that a fresh sea breeze was blowing and a sail was coming in, and that there was a glint of sunlight and the water was lapping. As it is, it's like a dream, having a nightmare or feeling homesick — let's move on, it's making me feel sad. A TALL, FORBEARING MAN: I am glad that there is still one landscape painter who pays attention to the strange conjunctures of the seasons and the sky, which produce the most striking effects in even the poorest regions. True, I would prefer it if he also had the gift and the technique to represent it truthfully; in this respect he is as far inferior to some of the Dutch School who have painted subjects similar to this as he is their superior in his overall approach. ..northerly Ossianic nature reflected the icy air and the chalck-cliffed coasts of the Baltic Sea where he was brought up. Friedrich has now given a task: someone wants to have two pictures - one representing an Italian landscape in all its luxuriant magnificent beauty, the other - the awe inspiring nature of the north. It is the second that Friedrich has undertaken to paint; he does not know what it will be. He is waiting for the moment of inspiration, which frequently comes to him, as he told me, in a dream. Even the things most necessary to painting - the box of paints, the bottles of linseed oil, and the oil-rag - were moved to the adjoining room, because Frederick [Friedrich] was of the opinion that any objects would disturb his inner world of imagination..
[Friedrich] ignores the use of light [and] does not strive to adjust his colors to one another or to create a harmony.. ..[but his pictures were] thought-out inventions..
From time to time I see the painter Friedrich here. He has started a large landscape [the painting 'Cemetery at Dusk'].. .A large iron gate, which leds into a cemetery, stand open; by the gate, leaning on one of his posts and partly covered by its shadow, a man and a woman can be seen.. ..who have just buried their child and in the night are looking at its grave.. ..it is just a little grass mound, besides which one can see a spade, Streaks of mist lie over the cemetery, they hide the tree trunks from sight so that they seem detached from the ground. One can make out other graves through the misty veil, and, above all, natural monuments[! ]; an upright stone looks like a grey ghost. He never made sketches, cartoons, or color studies for his paintings, because he stated (and certainly he was not entirely wrong), that such aids chill the imagination somewhat. He did not begin to paint an image until it stood, living, in the presence of his soul.. 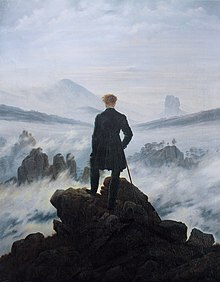 In landscape it was Friedrich above all whose profound and vigorous mind, with total originality, laid hold of this tangle of banality, staleness, and tedium and—cutting through it with a mordant melancholy — raised from its midst a distinctively new and radiant poetic tendency. What a picture of death this landscape is!.. ..one shudders when looking at it. Artists and connoisseurs saw in Friedrich's art only a kind of mystic, because they themselves were only looking out for the mystic.. ..They did not see Friedrich's faithful and conscientious study of nature in everything he represented. This picture [ 'Man and Woman contemplating the Moon',] full of sentiment and the quietness of nature, was painted by Friedrich in 1819 and he gave it to me in exchange for one of my own works. Friedrich had to copy it several times, but he did not approve of this, hence others copied it as well. Only the deserved destination for the picture, the Royal Picture Gallery, could convince me to part with it. Friedrich, with his somewhat stiff and diffuse but highly poetic manner, was the first artist — in painting as a whole, but more especially in landscape painting — who ever assailed and shook up the philistines of Dresden. There had been a great stir when one of his paintings, a crucifix on a rock beneath dark fir trees and against the dying glow of an evening sky, had given rise to a literary controversy conducted on Friedrich's behalf by his friend Gerhard von Kügelchen [Kügelgen] and on the opposing side by a prosaic dilettante, a certain Herr von Ramdohr — to the latter's eventual discomfiture. He [Friedrich] was indeed a strange mixture of temperament, his moods ranging from the gravest seriousness to the gayest humor.. ..But anyone who knew only this side of Friedrich's personality, namely his deep melancholic seriousness, only knew half the man. I have met few people who have such a gift for telling jokes and such a sense of fun as he did, providing that he was in the company of people he liked. 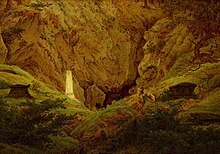 [Friedrich] worked in the frigid technique of his time, which could hardly inspire a school of modern painting.. 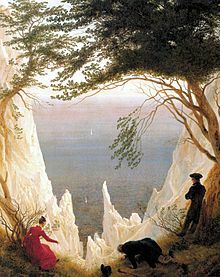 Thus a friend remembered the wanderings of Caspar David Friedrich as a young painter on the Baltic island of Rugen in 1802. It was Friedrich's favorite posture: Homo romanticus out in the weather, saluting the crag. He never made the obligatory journey south to study in Rome; his subject matter was the foggy and precipitous vista, sublimely expansive and filled with premonitory brooding. The writer Ludwig Tieck believed Friedrich was the Nordic genius incarnate, whose mission was "to express and suggest most sensitively the solemn sadness and religious stimulus which seem recently to be reviving our German world in a strange way." Friedrich's work, the Dresden painter Ludwig Richter remarked in 1825, does not deal with "the spirit and importance of nature.. ..Friedrich chains us to an abstract idea, using the forms of nature in a purely allegorical manner, as signs and hieroglyphs." The revolutionaire and seaport scenes of Lorrain [French painter Claude Lorrain, strongly admired by Friedrich] contain many artistic principles which form an important part of Friedrich’s style: melting distances where water and sky merge as one, the portrayal of a dreamlike unreal world beyond, seascapes in which early morning light dissolves into mist which engulfs ships that appear as mysterious aspparations, magically floating in fluid ether. The assumtion that Friedrich is an isolated figure in the history of art is not correct. Friedrich's written commentary on aesthetics was limited to a collection of aphorisms set down in 1830, in which he explained the need for the artist to match natural observation with an introspective scrutiny of his own personality. The isolation of Friedrich's back-view figures [in his pictures] underscores their importance. They are alone, solitary, in pairs or in a small group, in a natural setting. They are aliens in the elementary coordinate system of nature. One always feels that they have only just now entered the painting, to pause for a long moment and then go on. It is significant, as William Vaughan remarks in his introduction to Borsch-Supan's catalogue, that churches never appear in Friedrich's work except in the distance, as unreal visions, or as ruins. The visible Church is dead, only the invisible Church, in the heart or revealed through Nature, is alive. This is part of Friedrich's Pietist heritage, a personal religion that refuses all outward forms, all doctrine. To put a landscape on an altar is an aggressive act, as destructive of the old forms as it is creative of a new sensibility. How does Friedrich persuade us, again and again, that we are at the very edge of the natural world, ready at last to immerse ourselves in something that, for want of a better word, must be called the supernatural – a domain of the mystical speculation about human life and afterlife that before the Romantics found a proper home in the church? To see any of Friedrich's paintings as simply nationalist is, however, mistaken. His paintings are not celebrations of German mysticism so much as examinations of it. Friedrich uses the emptiness of the Baltic shore and the Thuringian forest to suggest the hubris of empire. He is not the prophet of German territorial ambition but its satirist. Friedrich's theme is the unconquerability of space. Human beings are tiny interlopers in a world they can never hope to rule. He exposes authority - of the monarchical states, Prussia and the rest, from which German liberals felt so alienated. When not converging on literally nothing, his pictorial schemes address objects that are either remote, like the moon, or obdurate, like the battered oak. Human figures intercept our gaze and transmit it into ineffable distance. The pictures don't give; they take. Something is drawn out of us with a harrowing effect, which Friedrich's use of color nudges toward intoxication. What at first seem to be mere tints in a tonal range combust into distinctly scented, disembodied hues: drenching purples and scratchy russets, plum. This page was last edited on 7 July 2018, at 15:34.